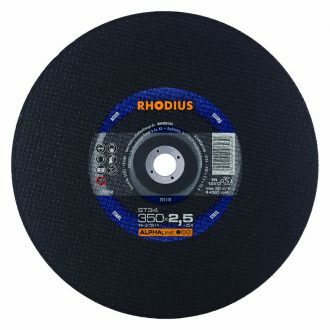 The Rhodius 350mm Cutting Disc ST34 is a stationary cutting disc designed especially for chop saws and workshop machines. The Rhodius 350mm Cutting Disc ST34 is ideal for cutting through steel materials and features a high cutting speed and long lifetime. The Rhodius 350mm Cutting Disc ST34 is part of the ALPHAline series. ALPHAline products are reliable grinding tools with an attractive price-performance ratio for the price-conscious expert.